Contractions are shortened words. The word that is formed by shortening one or more words is known as a contraction. An apostrophe is used to replace the missing letter or letters. Some common examples include: I’m, shouldn’t, o’ clock, etc. 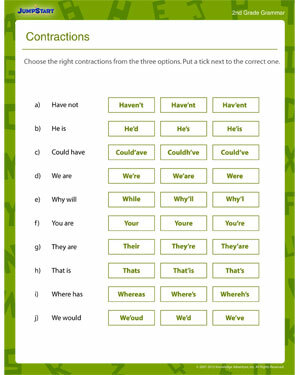 JumpStart’s ‘Contractions’ is a fun 2nd grade grammar worksheet for kids. This worksheet introduces second graders to commonly used contractions and encourages them to learn to use them in sentences. Free and printable contraction worksheets like this one will help kids in second grade enhance their writing skills! Check out more 2nd grade English worksheets.